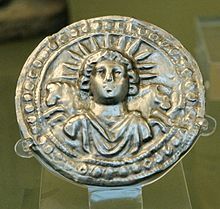 From Middle English silver, selver, sulver, from Old English seolfor, seolofor (“silver”), from Proto-Germanic *silubrą (“silver”), of uncertain origin. Cognate with Saterland Frisian Säälwer (“silver”), West Frisian sulver (“silver”), Dutch zilver (“silver”), German Low German Silver, Sülver (“silver”), German Silber (“silver”), Swedish silver (“silver”), Icelandic silfur (“silver”). A further derivation from Proto-Indo-European *silubʰr-, *silebʰr- (“silver”) is not supported by cognates outside of Proto-Germanic. The Germanic word has parallels in Baltic and Slavic (Old Church Slavonic сьрєбро (sĭrebro), Lithuanian sidabras), Celtic (Celtiberian silaPur-), and outside Indo-European, in Basque (zilar, zilhar and further dialectal variants) and perhaps Berber (Tashelhit aẓrf), but the ultimate origin of the word is unknown. A Wanderwort of ultimately Semitic origin has been suggested (Akkadian 𒀫𒁍𒌝 (ṣurpum, “silver”), from 𒍝𒊏𒁍𒌝 (ṣarāpum, “to smelt or refine”)). However at least one scholar has considered this phonologically and geographically improbable. “Silver” in David Barthelmy, Webmineral Mineralogy Database , 1997–. From Old Dutch silver, from Proto-Germanic *silubrą. From Old English seolfor, seolofor (“silver”), from Proto-Germanic *silubrą (“silver”). From Old Norse silfr, from Proto-Germanic *silubrą. From Old Swedish silver, from Old Norse silfr, from Proto-Germanic *silubrą.